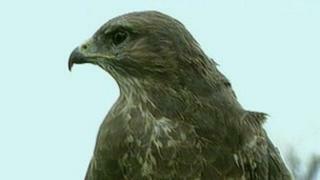 Tests on a bird of prey found dead on Sheriffmuir, near Stirling, have revealed that the animal was poisoned. The buzzard was found by a member of the public in September. Police said they were treating the incident as an "intentional killing" after tests proved the bird had ingested poison. They have appealed to visitors to the Ochil Hills and the Sheriffmuir area to contact them if they have any information about the killing. Insp Gerry McMenemy said: "The buzzard was found by a member of the public and subsequent investigations proved the bird had been killed by ingestion of poison. "We are treating the incident as an intentional killing of a protected bird and are appealing for anyone who has any information that may be relevant to this crime to contact us."